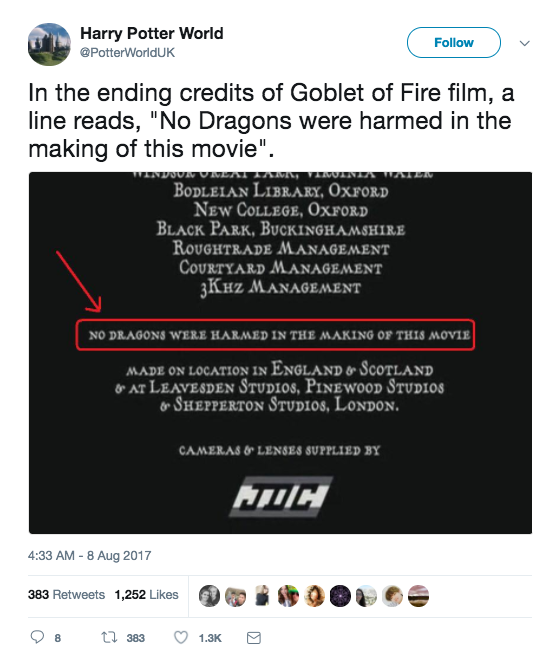 In the credits for The Goblet of Fire, the filmmakers make sure to reassure us that no dragons were harmed in the making of the film. When Neville receives his Rememberall - a ball that fills with red smoke when you forget something - his Rememberall instantly turns red, to which he exclaims "The problem is, I can't remember what I've forgotten." In this scene from the first movie, Harry's scar begins to burn as Snape is looking at him, leading Harry to believe Snape is evil and behind the burning scar. In fact, his scar is burning because he is facing Voldemort, because Quirrell has his back turned to him. Did you notice this billboard behind Dumbledore in Half-Blood Prince? It’s for a perfume called Divine Magic. There’s just no way that’s a coincidence, right!? 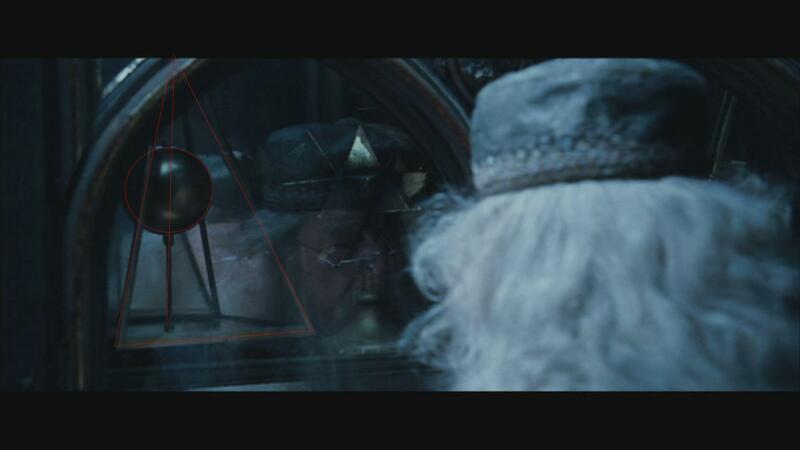 In Goblet of Fire, Dumbledore brings Harry to his office to warn him about the dangers he may face. And there just happens to be a Deathly Hallows symbol there. OK, this one is just kind of bizarre. Look closely at the wall right above Ginny’s head in this scene from Half-Blood Prince. During the Quidditch World Cup, you can briefly see Dobby, at this point a free elf, riding a llama in all the excitement. He can do whatever he wants, after all! Wouldn't you recognise the Cliffs of Moher anywhere? In The Half-Blood Prince when Dumbledore shows Harry his memory of first meeting Tom Riddle, a photo of the cave where he would go on to hide one of his Horcrux's can be seen. In the same above scene, there is a close-up of seven stones precariously placed on the windowsill, foreshadowing his change to Voldemort, splitting his soul into seven parts. When Trelawney enters the Great Hall and goes to join the table for dinner, she counts 12 people already sitting down. "If I join the table, we shall be thirteen!" she says. "Nothing could be more unlucky! Never forget that when 13 dine together, the first to rise will be the first to die!" But Trelawney (and the rest of the table) didn't realize that 13 people were already dining. Peter Pettigrew, disguised as Scabbers the rat, was at the table. Dumbledore had stood up to greet Trelawney when she first entered the room, making him the real "first to rise" after 13 were dining. He later becomes the first to die of all the people who were at that table. Few things are as satisfying as seeing all of the characters of Harry Potter grown up, peaceful, and happy with their own families at the conclusion of Harry Potter and the Deathly Hallows Part Two. The concluding sequence of this movie and the entire franchise features Harry, Ginny, Hermione, and Ron whisking off their own young children to Hogwarts at King’s Cross Station in London just as they had traveled themselves earlier in the franchise. A brief glimpse of Draco Malfoy, his wife, and his own son can also be seen in this sequence. As it would turn out, there’s a special story behind Malfoy’s wife in this scene. The character was actually played by Tom Felton’s real-life girlfriend at the time, Jade Olivia. Olivia was a stunt assistant on the Harry Potter movies and had been dating Felton for some years before the final installment of the franchise. Even though Felton and Olivia broke up sometime later, her cameo is just yet another entertaining detail that adds a bit of flair to the series. Who could forget Professor Severus Snape's big introduction in Harry Potter and the Sorcerer's Stone? Snape dramatically barges into the room and gives a lengthy, intimidating monologue about how potions is a complex subject that will cause many students to fail. When he notices that Harry is taking notes and thinks that the young Potter is ignoring him, Snape barrages Harry with a series of questions and embarrasses him in front of the class when Harry can't come up with the answers. However, while this interrogation at first seems to be unfair and cruel to Harry, there is actually a coded message in Snape's comments. One of the questions Snape asks is if Harry knows what would result in adding the powdered root of asphodel to an infusion of wormwood. Harry doesn't know the answer, but that's not the important part. This is actually a coded comment that would be lost on all viewers that don't have an extensive knowledge of Victorian-era flower symbolism. Asphodel is a lily, which means demise under the Victorian flower code, while wormwood reflects loss and absence. Snape is actually referencing Harry's mother Lily with this comment, though it is lost on the young Potter, and many viewers too. Even though Snape is not revealed to be the complex character we know him to be today until much later on in the franchise, this scene subtly reveals how there is more than what meets the eye when it comes to Hogwarts' potion master. As McGonagall advances her attack on Snape and Snape defends he is doing much more than that. As he is fending off McGonagall's attacks, he directs them in the direction of the death eaters around him. This isn’t a mind-blowing realization; just a fun detail to observe. His teacups are the size of giant mugs!